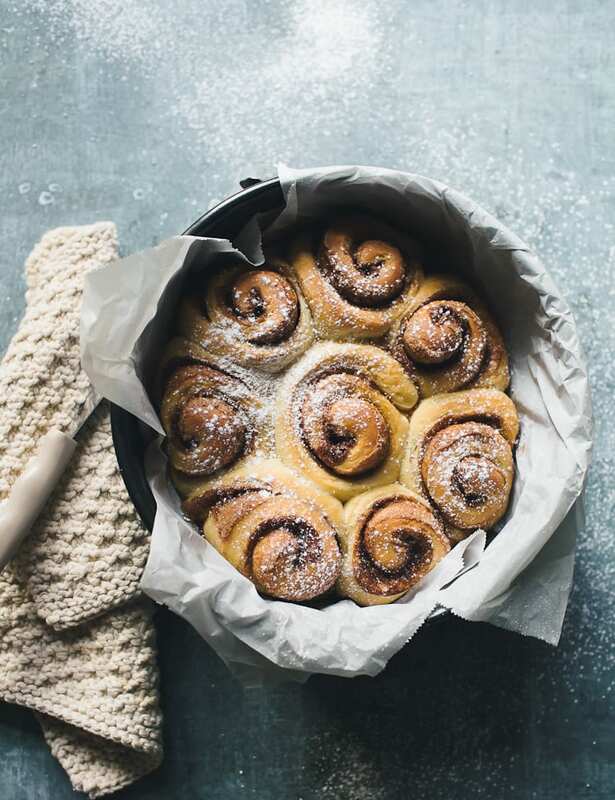 Soft, feathery scrolls of luscious sweet dough filled with swirls and swirls of cinnamon sugar. I mean c’mon people! This is what cozy Christmas mornings are made of! I must confess however, I wasn’t always a fan. Traditional cinnamon rolls were always way too sweet for my taste and all that heavy, sugary glaze always made me nauseas. And plus, with all the recipes out there (and there are tons) I thought to myself: does the world really need another cinnamon roll recipe? Interestingly enough, many of you have requested a sourdough version. SOURDOUGH. It lends a lovely (not sour) flavor that will make you weak in the knees. Just ask my Dad- he didn’t say a word when he ate his first one. MAKE-AHEAD. I’ll give you two fool-proof schedules to fit this recipe into your busy life, including Christmas morning. EASY. You know I don’t mess around with unnecessary steps and ingredients! Okay, so first let me preface by saying this is an adaptation from my book Artisan Sourdough Made Simple. I used the Sweet Dough recipe (works like a dream!) and topped it with a quick cinnamon- sugar filling. I truly believe that once you master a particular dough like this one, it makes sense to use it in other applications. *BEFORE YOU BEGIN: Check out the Baker’s Schedule at the bottom of this post. This way, you’ll have a better idea of when to start the dough. I’m a huge fan of overnight doughs. This one is made in a stand mixer because the texture is tacky, and it’s just not that fun to mix by hand. Once the dough is made, cover the bowl with a damp cloth and let rise overnight at room temperature until it has doubled in size. As always, the rise times will vary according to the room temperature and dough temperature. I made my dough at 8:00 PM and it was ready by 8:00 AM. The temperature was 67 F.
Okay, so when your dough has fully risen, the first thing you need to do is lightly oil and flour your countertop. The dough won’t stick! This is THE BEST tip in the world, by the way. I use an all-natural olive oil spray from Trader Joe’s. Tip: I’ve tested coating the surface with butter instead of oil, and it doesn’t quite work as well. If the weather is cold, the butter will harden slightly which defeats the purpose. After you have removed the dough from the bowl, gently stretch and fold the edges toward the center to gently deflate some of the air. Then flip the dough over, and let it rest for 15 minutes to relax the gluten. It will be easier to roll out this way. Lightly dust the dough with flour and do the same for your rolling pin. Roll the dough into a 16 x 12-ish rectangle. This specific measurement yields approximately (8x) 1 1/2- 2-inch cinnamon rolls which will fit a 9-inch springform pan. If at any point the dough shows resistance and is no longer easy to roll, let it relax for another 10 minutes and then try again. Don’t force it. The dough will always tell you what to do. To make the filling, melt some butter in a shallow pan or microwave. Combine the cinnamon and sugar in a small bowl and set aside. Once the butter has cooled slightly, brush the entire surface of the dough, including all the sides. This will help the cinnamon-sugar mixture stick nicely. Sprinkle the dough with the cinnamon-sugar mixture leaving a 1/2-inch border around the edges. Once the surface is evenly coated smooth it out with your hands. The texture will go from dry and sandy to almost wet-looking. Using lightly oiled fingertips, working with the long side of the dough (which may seem counterintuitive), roll it into a log pressing down as you go. Take your time with this step. You want the log to be somewhat tight so that the swirls stay in tact when baked. Once you get to the end, make sure the dough is facing seam side down. 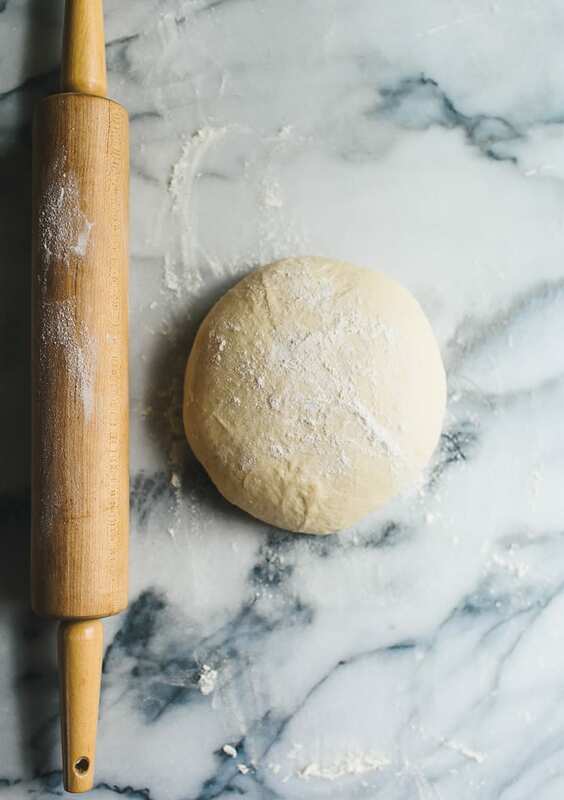 Tip: If at any point the dough starts to stick (it tends to get warm from the heat of your hands) lightly oil or flour your fingertips, take a deep breath, and try working with it again. To cut the dough, portion the log into 1 1/2- 2 inch sections using an oiled knife or bench scraper (this is the one I use). For best results, gently score the dough first so that each piece is roughly the same size. I’m the worst at eyeballing stuff like this. Scoring really helps! Place the rolls into a 9-inch parchment lined springform pan and let rest for about 1-2 hours, or until the dough puffs up. Tip: I like to scrunch up the parchment into a ball first, open it up, and then line the pan. It tends to stay more snug this way. Place the dough onto the center rack and bake @ 350 for 40-45 minutes. The tops should be light golden brown and the internal temperature should read 190 F.
Cool in the pan for 15 minutes, and then remove to a wire rack. While the rolls are cooling make the glaze. Add softened butter, whipped cream cheese, and sifted powdered sugar to a bowl. Beat with a hand held mixer until smooth, thinning out the consistency with a little milk as needed. To serve, lightly dust the cinnamon rolls with powdered sugar (my preference) or top with some of the glaze. Close your eyes and take a bite… the warm, caramelized cinnamon sugar is absolutely out-of-this-world! And all that fluffy dough? 1.) General Overnight Option for Any Day of the Week: Make the dough in the evening and let rise overnight. The following morning, roll, cut, and rest the dough for 1-2 hours. Bake straight away. As an alternative, after resting for 1 hour, cover the dough and chill until ready to bake later in the day. Return to room temperature before baking. 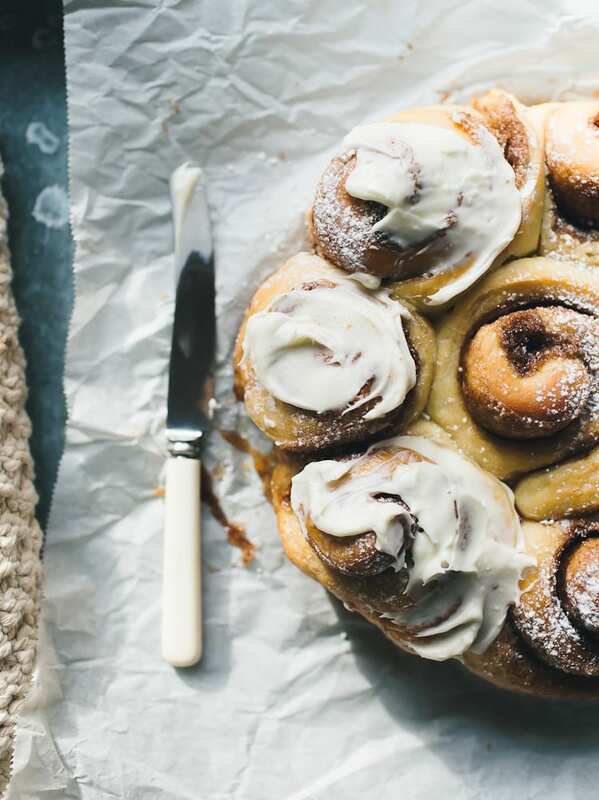 These overnight sourdough cinnamon rolls are the perfect weekend or holiday treat! 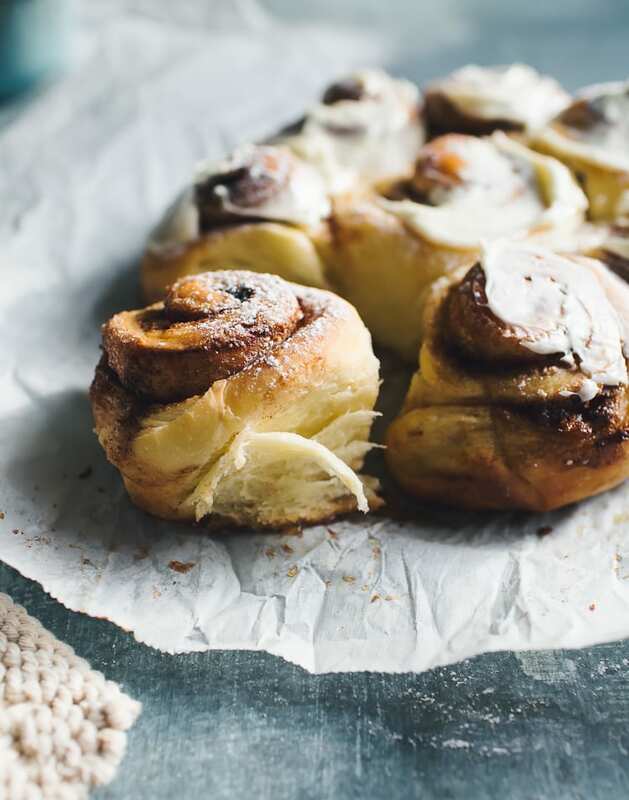 Made with a luscious sweet dough and not-too-sweet cinnamon filing, they are guaranteed to be a huge hit. Before you begin, have a look at the Baker’s Schedules in the blog post above and choose one to suit your preference. In the evening, warm the milk and 28 g (2 tbsp) butter in a shallow pan or microwave. Cool slightly before using. Add the egg, starter, and sugar to the bowl of a stand mixer. Mix to combine using the paddle attachment. With the machine running, slowly pour in the warm milk mixture. Add the flour and salt, and continue mixing until a rough dough forms, about 1 minute. Scrape down the sides of the bowl as needed. Cover with a damp towel and let rest for 30 minutes. After the dough has rested, switch to the dough hook and knead on medium-low speed for 6-8 minutes (I use #2 or #3 on my stand mixer). The dough should be soft and pull away from the sides of the bowl when ready. If it seems very sticky (although it should be tacky), add just a sprinkle of flour to incorporate. Transfer the dough to a medium bowl, coated in butter. Cover with a damp towel and let rest for another 30 minutes. After resting, grab a portion of the dough and stretch and fold it toward the center of the bowl. Repeat this 4 times, turning the bowl as you go. This will aerate the dough and make it feel soft and supply. Cover again, and let rise overnight at room temperature until double in size. This can take anywhere from 8-12 hours or more. The following morning, lightly oil and flour your countertop to prevent sticking. Gently coax the dough out of the bowl. Stretch and fold the edges toward the center to gently deflate some of the air. Using floured fingertips, flip the dough over, give it a nice pat, and let it rest for 15 minutes to relax the gluten. It will be easier to roll out this way. Line an 9-inch springform pan with parchment paper, leaving enough to hang over the sides for easy removal. 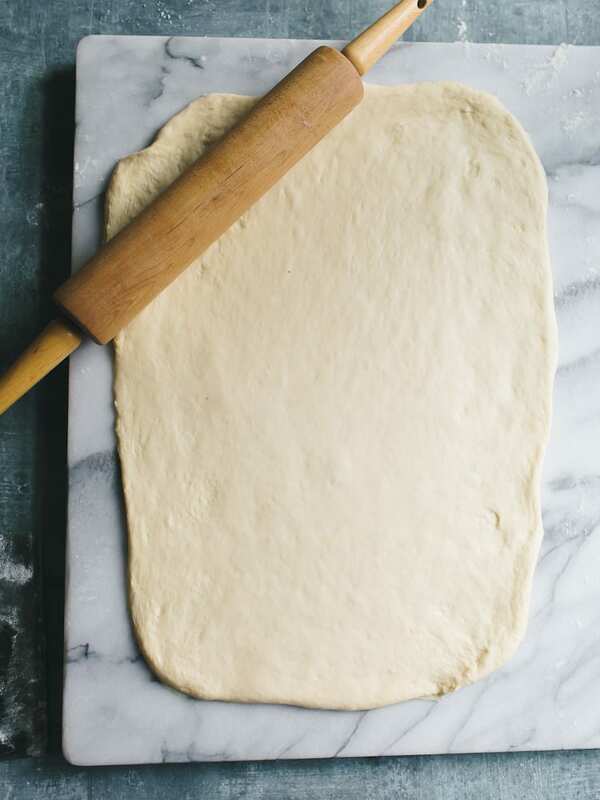 Lightly dust the surface of your dough with flour and then do the same for your rolling pin. Roll the dough into a 16 x 12-ish rectangle to yield (8x) 1 1/2- 2-inch cinnamon rolls. If at any point the dough shows resistance and is no longer easy to roll, let it relax for another 10 minutes and then try again. Melt the remaining 28 g (2 tbsp) of butter in a shallow pan or microwave. Combine the cinnamon and sugar in a separate small bowl and set aside. Once the butter has cooled slightly, brush the entire surface of the dough, including all the sides. 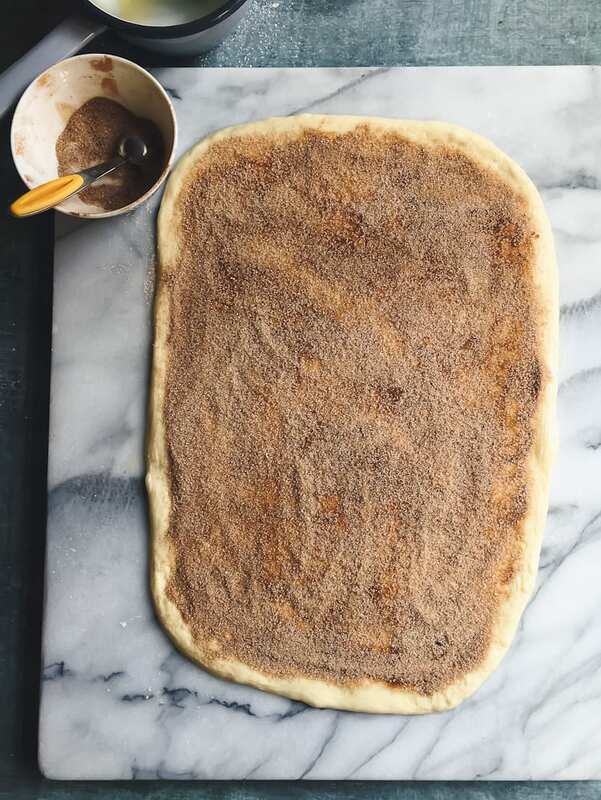 Using your hands, sprinkle the dough with the cinnamon sugar mixture leaving a 1/2-inch border around the edges. 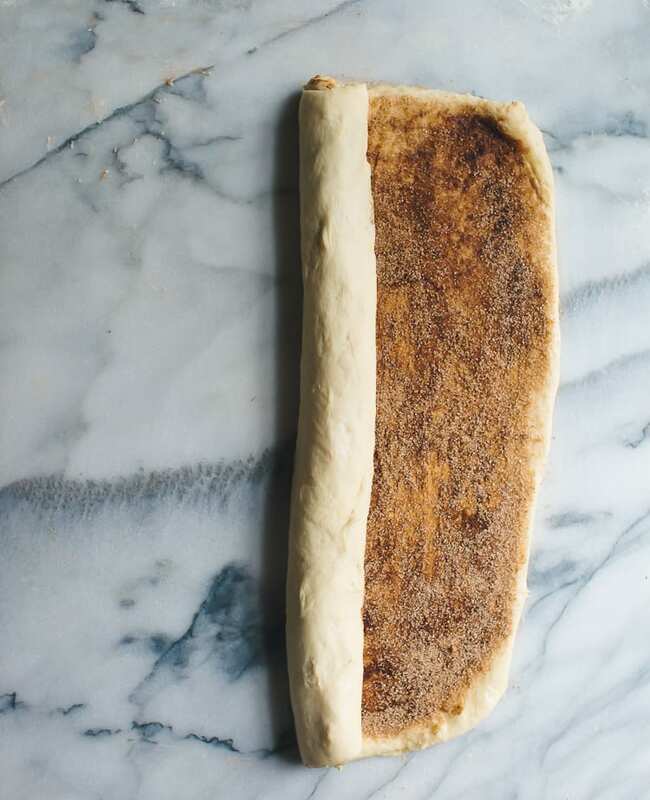 Using lightly oiled fingertips, working with the long side of the dough (16-inch), roll it up pressing down as you go. Take your time with this step. You want the log to be somewhat tight so that the swirls stay in tact when baked. Once you get to the end, make sure the dough is facing seam side down. If at any point the dough starts to stick (it tends to get warm from the heat of your hands) lightly oil or flour your fingertips, take a deep breath, and try working with it again. To cut the dough, portion the log into 1 1/2- 2 inch sections using a oiled knife or bench scraper. My rolls were 2 inches. For best results, gently score the dough first so that each piece is roughly the same size. 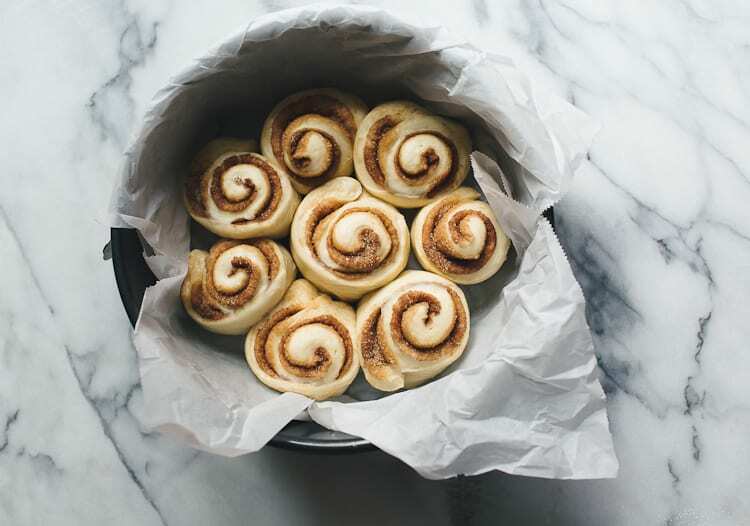 Place the rolls into an 9-inch parchment lined springform pan and let rest for about 1-2 hours, or until the dough puffs up. I like to scrunch the parchment into a ball first, open it up, and then line the pan. It tends to stay more snug this way. Preheat your oven to 350 F. Place the dough onto the center rack and bake for 40-45 minutes. The tops should be light golden brown and the internal temperature should read 190 F. Cool in the pan for 15 minutes, and then remove to a wire rack. Optional step: While the rolls are cooling make the glaze. Add softened butter, whipped cream cheese, and sifted powdered sugar to a bowl. Beat with a hand held mixer until smooth, thinning out the consistency with a little milk as needed. The ingredients must be soft and at room temperature for best results! To serve, lightly dust the top with powdered sugar (my preference) or top with some of the glaze. These rolls are best enjoyed slightly warm and on the same day they are baked. Thanks Emilie!!! I was just about to look for a sourdough cinnamon roll recipe and this popped up in my email! Can’t wait to give it a try! rise, room temperature or in the fridge? Thanks. Thank you! The overnight rise is at room temperature. I had the same question! These look amazing, and I am going to try them. I love your sourdough book!!! Thank you I was wondering if I could double the recipe for a large crowd? They look divine Emilie and so inspiring that I’m going to the kitchen straight away to start feeding my starter. Incidentally, since reading your book and following your tips, my starter is looking much perkier than it did previously. Ahh… that’s so wonderful to hear! Sourdough starters can be so fickle, you know? I hope enjoy these rolls. Merry Christmas! Hi Nancy! Thanks so much. I’m glad you appreciate my thoroughness ;) Happy Holidays! until now. I bought your book last month and have been having a great time. The bread is out of this world and the waffles are the best I’ve ever made. I am using a heating sleeve I usually use on my kombucha crock to surround my sourdough starter jar to keep it nice and warm since my kitchen is always cold. Works like a charm. I will be making these cinnamon rolls for Christmas morning. Made the waffles this morning (Christmas Eve) and have the cinnamon rolls frozen waiting to defrost tonight for tomorrow morning. I can’t wait to taste them! Merry Christmas to you and yours, Emilie. Hi Melanie! Sounds fantastic! Hope you enjoy every last crumb :) Merry Christmas! This recipe could not have come at a better time. 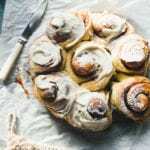 I’ve been baking with sourdough for a couple of years and I’m always on the lookout for a better sourdough cinnamon roll recipe. This one looks perfect. Thank you! p.s. I just bought your book and can’t wait to start on the focaccia! I’m going to start making these today. Thank you for the adaptation to the book recipe (I’m working through your book – it’s fabulous) and your tips- the ability to make and freeze in advance is a gift! I also have to try scrunching my parchment as you suggest. That might reduce the bad language. just curious is it possible for me to add a lil commercial yeast spike for faster proofing time? just in case the need of baking some in such a short time. Can I use Bisquick? LOL. What a thoughtful tutorial Emilie – your passion is apparent on every line and your rolls look simply divine. Most of all, Merry, Merry Christmas to you and your beautiful boys! x.
Hi I was wondering if I could use the discard from my refrigerated sourdough starter when I feed it this week? I love your pictures and all the tips. Thanks! Hi there! I wouldn’t use discarded starter for this recipe, because you need bubbly, active starter to make the dough rise. Otherwise it will be flat! Does that make sense? Thank you so much for this simple but delicious recipe. I am going to start the dough in just a few minutes, and add some toasted pecans to the filling mixture, for my husband’s smile. I have both of your books and they are great. I love your clear and relatively uncomplicated recipes. hi! This looks so delish! I was wondering how long could I keep the rolls in the freezer after frozen? Hi there! As long as they’re wrapped and stored properly, maybe 1-2 months? You’re basically trying to prevent freezer burn and unnecessary thawing. If all looks good then the frozen rolls should be fine. I am in the midst of making these amazing wonders. I have made brioche ones that were great but were very heavy so I am looking forward to having these tomorrow! One question: the remaining 14g of butter is what you use to spread on the rolled out dough, correct? I figured that was where the remainder of the divided butter went but wanted to make sure. Thanks for the recipe, definitely a keeper! Made these for christmas breakfast. Overnight fermented in the fridge though since my starter is super active and needed to be slowed down a bit after quickly filling the bowl. These came out great. Not super sweet or gooey. We each ate two easily. Thanks and merry christmas! Tripled the recipe for Christmas morning breakfast… they were absolutely outstanding. I made the dough the night of the 23rd, let rise overnight, rolled out the afternoon of the 24th, let rise for about an hour until puffy, refrigerated until the morning of the 25th, let sit at room temp for an hour, then baked. Amazing!! Thank you SO much! I tripled as written, and used a bench scraper to divide the dough in thirds after the overnight rise. I have a larger capacity stand mixer, and I have been working with sourdough for a few years now, so I felt comfortable tripling as I knew what to watch for in regards to dough readiness. Hope this helps! Thanks again!! I used a similar timetable for a doubled recipe! I didn’t want to do 2 separate batches because that would have required too many bowls and switching things in the mixer. ;) They came out delicious! I just tagged you on IG so you can see them if you want. 12/30: dough finished at 8:45pm. I let it rise overnight on the counter (prob about 65 degrees) then put in the fridge at 6:30 am. 12/31: rolled the dough out at 1pm, put it in the fridge at 3:30pm. 1/1: removed from fridge at 8am, baked at 9am. My rolls didn’t puff up after I popped them into the cake pan after rolling and cutting them. My only thought is maybe I rolled the dough too thin..Any thoughts? I am sure they will still taste delicious – and I am keen to try them again asap! Just baked the cinnamon rolls that was frozen for one week, followed your instructions exactly. They looked perfect when I froze them, defrosted overnight but did not puff up like i hoped for or like your photo. I would like make them again any suggestions? I made two batches the other batch is still in the freezer. Hi Vera! Since temperature dictates time, it’s possible that the temperature (where the dough was rising) was just too cold. That’s why in the morning the dough wasn’t puffy. This happens sometimes. For your next batch, I would defrost overnight in a warmer spot if possible, and see if that helps. If you can’t find a warmer spot, try giving the dough more time in the morning before baking. Once the dough puffs up properly, the final texture should be more light and airy. As a rule of thumb, what your dough looks like before it goes into the oven is usually an indicator of what it will look like after it’s baked. If the dough looks dense, the end product might be too! Hope this helps, good luck! x And PS: thank you SO MUCH for supporting the book! Hello! These look absolutely delicious! I really want to try these someday soon, but the only problem is that I don’t have a stand mixer! I know you way that you need to make these using one, but would it be possible to do it by hand? I know it would be a lot harder, but is it possibls! Oh, My! This recipe is perfection. I don’t frost mine either and they are absolutely delicious. I have your book and am learning a great deal about sour dough :-) I truly love the fact that these are not overly-sweet. I was sick the entire month of December and missed my baking, so I’m back at it. Thank you for posting this! These rolls are simply dreamy!! I saw a link to this recipe yesterday (1/19) and was so enamored of the recipe, I bought your cookbook AND made the dough last night, baked this morning and ooo-la-di-dah … these are wonderful. The dough is a dream to work with, easy to put together and all went according to your overnight schedule. My starter is active and strong and not sour so worked wonderfully. I measured by weight and did not tweak a thing except to add raisins to half of the rolls. I very much appreciate the “Baker’s Schedules”! While I can and mostly must figure out for myself the timing, it is certainly handy to have that done for me :) I make a cracker from discard but saw your “puff crackers” and those might happen this weekend also. Love what I’ve seen in the cookbook so far – I bought the Kindle version. I’ve been working with sourdough a bit over 2 years and no issues so I bought primarily for the recipes and have a number marked to make. Directions are clear and great photos. Oh, your blog photos are gorgeous as well. Thank you for the very thorough and detailed recipe! I’m pretty sensitive to sugar, so I cut the filling sugar in half and then when I was putting it in, I probably only used half of that. For the record, my husband and daughter liked them that way, but I thought I went a bit too far. Also subbed in about 25% whole wheat flour. I’m new to sourdough and appreciate this contribution to my education. This recipe is bulletproof. Im planning on serving these tomorrow morning for a fun brunch with friends. I try to stay away from dairy so do you think I could use almond milk instead? Also, I was going to go ahead and make the dough now, let it rise for about 10 hours and then assemble everything. Do you think I could just put them in the fridge until tomorrow morning and then bake them in the morning? I just dont want to put them in the freezer tonight and then them be too hard to bake in the morning! Any advice would be so appreciated! And yes- you can refrigerate the assembled rolls, covered in lightly oiled plastic wrap. But, in the morning, make sure to give the dough enough time to puff up before baking.Dense dough = dense bread. Does that make sense? Sometimes, I’ll put the rolls in my oven (off) with the light turned on for 30 minutes or so. The warmth helps to speed things up. I loved this recipe! I made my rolls a little bit smaller and thinner (the yield was 12) and and I was short on time, I skipped the little steps, like letting the dough rest for 15, 30 minutes. Thank you, thank you, thank you, for sharing! I’ve made these time and time again. Last time I added blitzed walnuts in with the cinnamon sugar mixture- so good! I love your sourdough book too :) Thank you! THESE ARE AMAZING! I bought your book a couple of months ago and it is my most used SD resource. This was my first time trying the sweet dough, and it’s to die for. I am a trained pastry chef and make cinnamon rolls all the time. My husband said these are the BEST he’s ever had! The best I’ve ever made, and the best he’s ever had, period! Thank you! 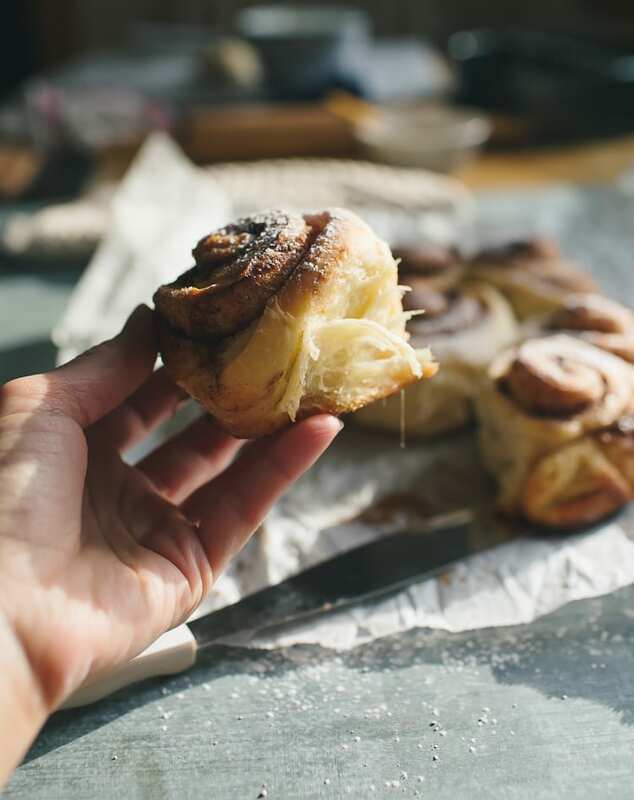 As far as I am concerned, Cinnamon Rolls are one of the five basic food groups. Just ask my husband. This is an absolutely superb post. Your step by step lesson is clear and addresses every eventuality, and your photographs are divine. May I add that I am loving your book, Artisan Sourdough Made Simple. Congratulations to you on a job very well done, amica. Okay, the spraying the surface with oil then flour is GENIUS! 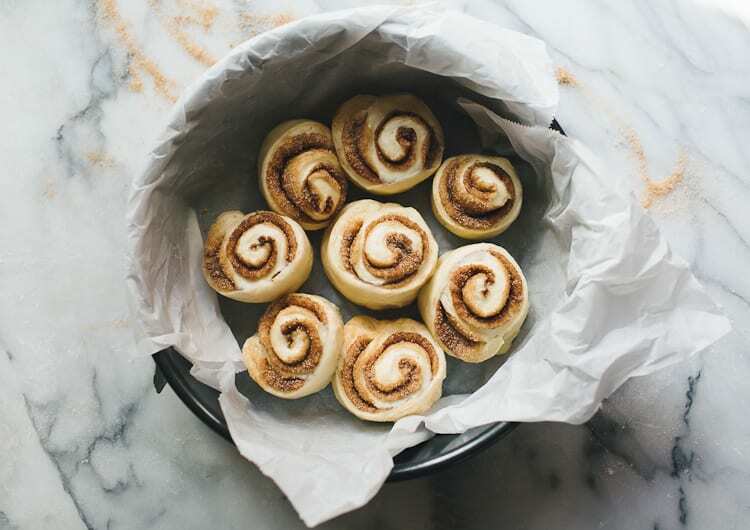 The cinnamon buns are proofing right now and will soon be in the oven… and I can hardly wait! Thanks for the awesome recipe. These are simply decadent! I do not have a mixer, so I hand kneaded them. I used my truty, thick rubber spatula when it called for a paddle attachment and my hands when it called for a dough hook. The dough was perfect! It was beautiful, easy to handle, and easy to roll out. The first time I made them, I swapped the cinnamon filling for 4 oz cream cheese and a few tablespoons of raspberry preserves. Incredible! The second time I made this cinnamon filling, and they were equally delicious. This is my go-to sweet roll recipe now! good. We follow a vegan diet and don’t use eggs. The above post is to say without an egg. Hi Helen, to be honest I wouldn’t make this recipe without the egg. If you cannot have egg, feel free to play around with an egg substitute, although I’m not sure how it will turn out. I would definitely experiment to see what comes up! These look great! I’ve been searching for something new besides the standard loaf to try, and I think these will be next! Question on timing- could I make the dough in the morning, let rise all day, then shape in evening, put in the fridge, pull out to come to room temp, then bake (on day 2)? I’m pretty confident working with my starter, but I’m still working out my timing. Thank you! This is my same question! Made these yesterday and they were prefect. Thank you! 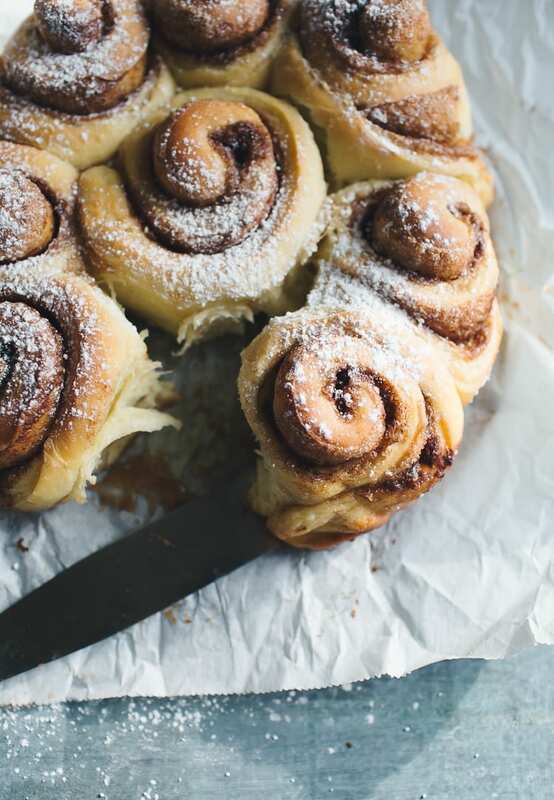 Sourdough cinnamon rolls has been on my “baking bucket list” for some time. I’m so excited to try out this recipe!! Only question is, the part where you rest for 30 minutes and then fold. Do you repeat this four times including letting it rest for 30 minutes between each fold or do you just fold each side? Do you think they will be ok frozen for a month? We will have family in town but i don’t always have time to bake, so thinking of doing it in advance! Thank you for this recipe, they are delicious! Yes- as long as they’re wrapped properly, one month is fine. The goal is to avoid freezer burn, so even longer than 1 month is fine as long as they look ok! Glad you like the recipe, thanks! I’ve tried other starter recipes and methods, but a friend gave me yours to try and it’s yielded the best sourdough yet! I just bought your book and am making your cinnamon roll recipe today. I had to make it like my Nana did, and add chopped nuts, a little brown sugar on the bottom and a few raisins in her honor! It’s rising now, and can’t wait to taste. The bread is amazing!! Do you have any recommendations on how to get the tangier sourdough flavor? Otherwise, it’s fabulous, thanks for your posts and advice! These are phenomenal! Just the perfect amount of sweetness for our family with a terrific punch of cinnamon flavor. Texture was perfect. I had a lot of discard starter that needed using so I went the commercial yeast route and adjusted my timeline accordingly. Added 1 1/2 teaspoons of instant yeast and recipe went without a hitch. I had never baked my cinnamon rolls in a springform pan with parchment. Genius! Easy to get them out of the pan and made for the easiest clean up. 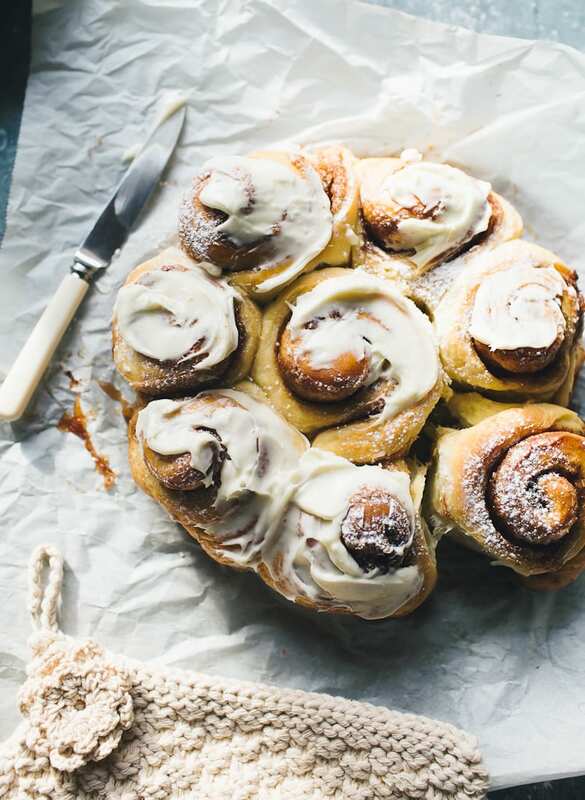 Big, beautiful, photo worthy cinnamon rolls! Another batch is in the freezer ready to go for a feature treat. I look forward to making them with a fully fed active starter in the future. Thank you! These are so good. In case anyone is curious, I made these vegan by subbing vanilla oat milk for the milk, vegan butter for regular, and left out the egg. They were delicious! I think the batch I made with an egg were slightly better, but if you’re baking for a crowd with dietary restrictions, they’ll never know. Thanks for the recipe and I love you book! I’m trying to make every recipe. I think I’ve done about half, and they have all turned out perfect. I tried making these with the second timeline for putting them in the freezer. They turned out so sour they were almost inedible, and we are very accustomed to eating sourdough baked goods. My guess is my sourdough is too active to need such long rising times, but as I did the overnight rises I wasn’t able to go to the next step when they were doubled in size. In both steps the dough was visibly over proofed. Also, my kitchen was quite chilly as in 62-65 degrees, so it wasn’t that it was too warm. My suggestion is if you know that you have a very active sourdough, it certainly won’t take the 8-12 hours that the recipe recommends. This recipe was so much fun! I fed my starter Friday night; made the dough Saturday night; rolled the dough with cinnamon-sugar and butter early Sunday morning; then baked half of the rolls (4) on parchment paper snuggly in my cast iron skillet. They puffed up so great! BUT the final texture seemed a little dry and bready. I wasn’t as happy as I had hoped. SECOND time around, the following weekend, I thawed out 2 frozen rolls inside of my oven overnight. They never puffed up, even while trying to warm them more the next morning. I didn’t want to waste them, so I baked them anyways (but for a shorter time than the original bake time). I was scared they would be dense and “incomplete” but I actually enjoyed them better than the first batch. They reminded me of cookie dough! So delicious. The next time I make these, I might use a whole lot more butter while incorporating a little bit of oil during the baking stage. Anyways, thank you! Looking forward to reading more recipes of yours. These are amazing!! My mom gave all the siblings and grandkids a starter from my Gramdmother’s kitchen after she passed. 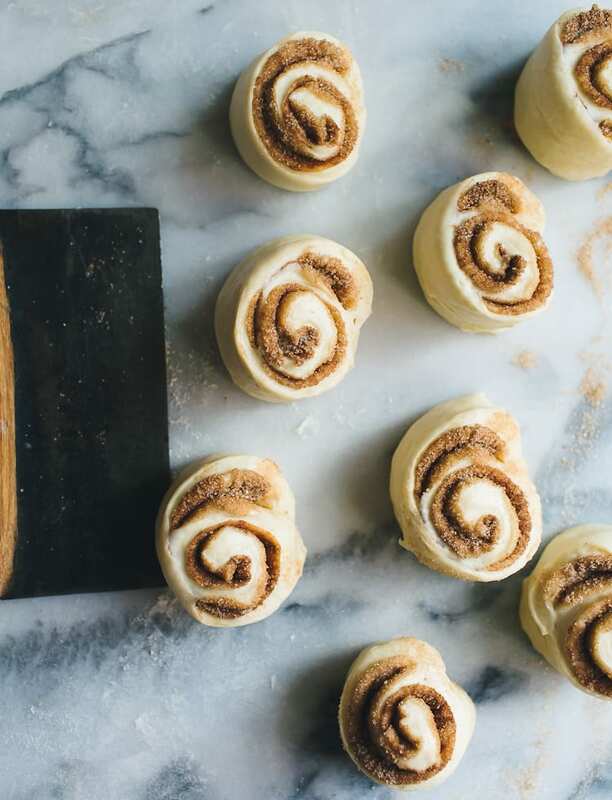 I used it in these cinnamon rolls and they are the best. I am so thankful I found this recipe. So good to mix it up a bit from just bread loafs and rolls. Have you tried this recipe with 50% whole wheat flour? I saw one commenter used 25% and apparently it was ok. I’d like to do 50% but I’m afraid it could be too dense. Great question. Unfortunately, I haven’t tried it with 50% ww flour. My initial thoughts is that it would be too dense following the recipe as is, without making additional adjustments (i.e. more butter, liquid, etc). Hope this helps! Hi! Thank you for such a thoughtful post! I am making your buns tonight. I just wondered how long after feeding our starter can we use it in this recipe? Thank you!!!! Hi Carrie! Great question. It all depends on your starter- it’s different for everyone. Generally speaking, the stronger the starter and warmer the temperature, the faster it will bubble and rise. For example, my starter is super, super strong. It’s over 10 years old. I feed it at room temp. every day (or every other day, if I forget), and it’s ready to use in only 1 hour, even in winter. On the flip side, if you have a newer starter, it can take anywhere from 2-12 hours or more before it’s ready to use, assuming you are feeding and caring for it correctly. Overall, the timing can definitely be frustrating. But with practice and most importantly observation, you’ll have a better understanding. Hope that makes sense! Keep on feeding that starter! These were the best cinnamon rolls I’ve ever made and the family gobbled them up. Unfortunately, I made a batch for later and froze the rolls. Took them out of the freezer the night before but found in the morning they disnt rise. There was a bit of liquid in the bottom of them pan. What did I do wrong? I was so bummed. Hey! I just measured 60g of milk into a liquid measuring cup and it looks like a bit less than 1/3 cup. Do you use 1/3 or 2/3 cup milk? Thanks!